"D" does no stand for Diane. "D" standing for Dawg as in Big Dawg! 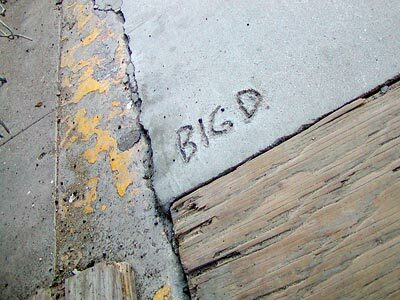 I should know because I am the artist... see my signature Crack on the sidewalk?! Dude, where'd your posts go? Ynnej, what are you talking about? Oops, that wasn't Velma, it was me posting. I was still logged in as her 'cause I was fixing her blog a couple days ago. Who's on first... I dunno who that?